Since 1999, key conservation and agricultural organizations have sponsored the River Friendly Farmer (RFF) Program. The statewide initiative recognizes farmers, who through good production management practices helps keep Indiana’s rivers, lakes and streams clean. 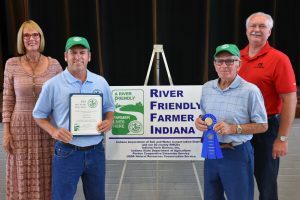 Annually, each county Soil and Water Conservation District may nominate up to two farmers who do an outstanding job of protecting their rivers, lakes and streams through their every day conservation management practices on the farm. 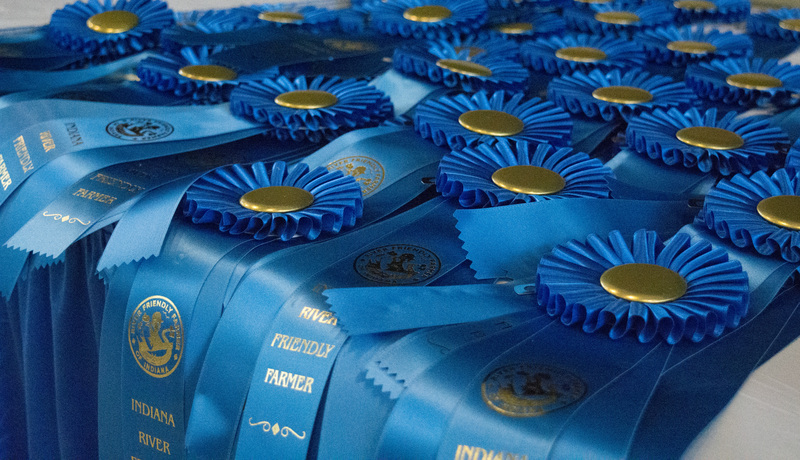 Watershed organizations also may nominate farmers for the award by submitting an application to a county SWCD. 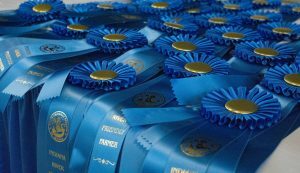 April 24: Nominations forms – online link open for acceptance. June 14: Nomination forms and Signature pages due. July 8: RSVPs for the event and additional apparel orders due. ~RSVP for the event and place additional apparel orders here (coming soon). 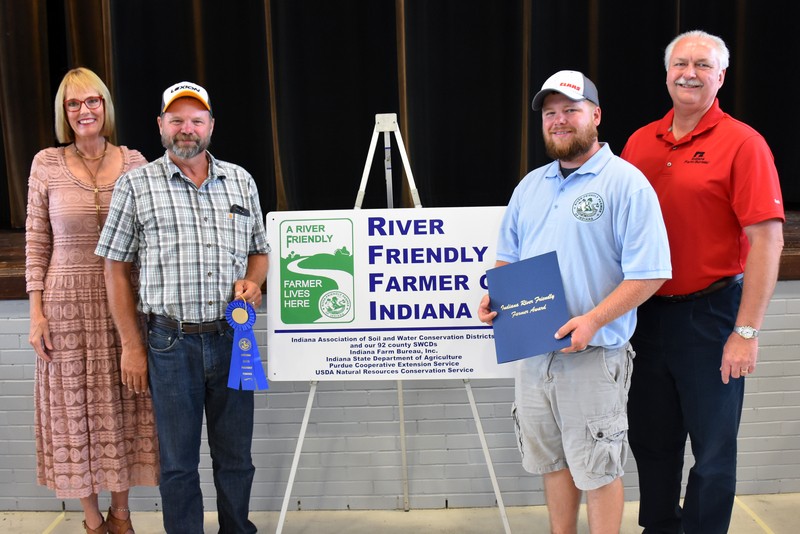 Adams County – Greg and Luke are an uncle and nephew team working to farm and keep the land sustainable for the future. They believe if you have healthy soil, you will have healthy people. 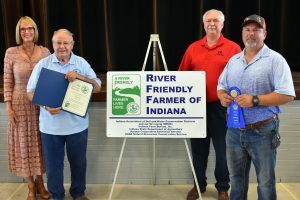 Fifteen years ago they began using cover crops especially on the highly erodible land they farm in the St. Marys and Upper Wabash watershed where the Wabash River and several ditches and streams run through their land. They have discovered the benefits of no-till and cover crops as more soil and nutrients stay on the farm now. Greg has served for six years on the Adams County Soil & Water Conservation District Board, the county plan commission along with other local leadership. Luke is involved in FSA and 4-H and both are Farm Bureau members. 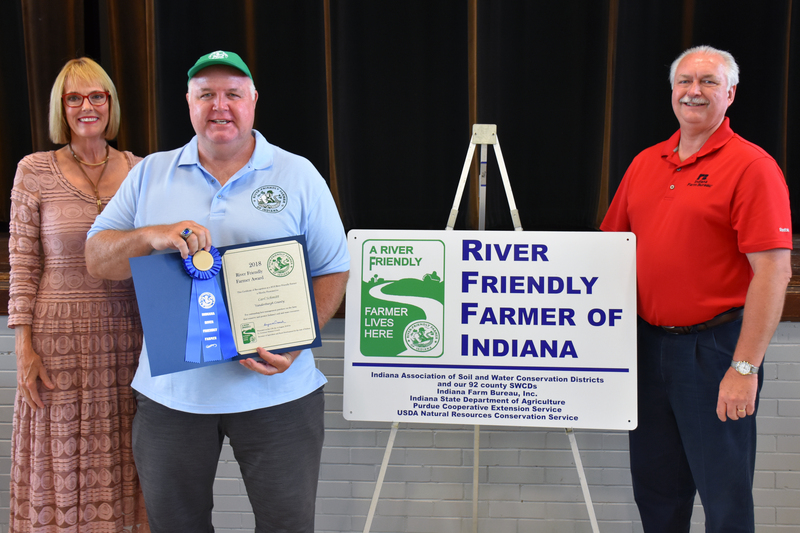 Adams County – Phil began farming with his dad over 40 years ago. His farm produces soybeans and corn and is located in the Upper Wabash watershed. He uses filter strips, and no-till. Now in his third year of using cover crops, he has had good results with root mass, organic matter and less erosion. He has less run-off, keeping soil in place, and less sediment goes into the river. 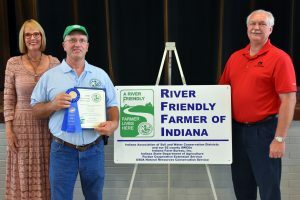 Cass County – By utilizing cover crops and a no-till program, Dennis has discovered less erosion issues and his dedicated waterways help with storm water management. Located in the Middle Wabash-Deer Watershed, he produces grain and livestock. He uses a Nutrient Management Program and filter strips. These strips have helped keep run off of fertilizer and manure from entering the Wabash River. Clay County – Persinger Farms Inc. produces grain, corn and soybeans. Less fertilizer is used on the property due to minimal strip tillage. This has decreased fuel consumption while also keeping the soil in place. Less erosion has decreased the amount of sediment running into the Eel River which runs through the farm. Tanner is a supervisor on the Clay County Soil & Water Conservation District Board. Tim and Tanner are recipients of the 2016 Clay County SWCD Friend of Conservation Award. They volunteer to dig the soil pits for the annual Districts’ Nature Bowl, an educational event for 7th grade students in Clay County. Daviess County – Dale L. Marchino began farming over 60 years ago with his father. Today, he farms alongside his son, Leonard, where they have implemented conservation practices such as no-till farming and fall cover crop plantings. They operate a farm that produces corn, soybeans, watermelon, pumpkins, tomatoes and cantaloupe. Prairie Creek runs through his farm and eventually leads to the Lower East Fork of the White River. He states that the establishment of fall cover crops on the majority of cropland and establishment of grass buffer strips in some highly erosive areas have helped to reduce sediment, particulate organics, and sediment-absorbed contaminants in surface water runoff and irrigation tail water before it enters into surrounding streams, creeks, and rivers. 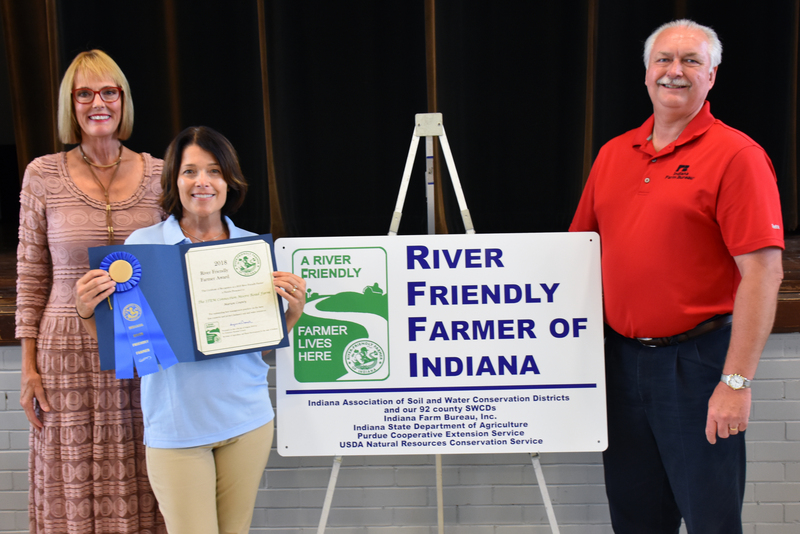 Dale has been an active participant of cover crop programs funded by the local SWCD through Clean Water Indiana and Lake and River Enhancement (LARE) programs administered by the State of Indiana. Dale is a retired elementary school teacher where he taught many students during his career spanning multiple decades. Decatur County – Ed’s father originally purchased 30 acres in 1931. Now Ed and his wife, Ruth, operate a little over 500 acres in the Upper East Fork White River Watershed producing corn and soybeans. He has witnessed a decrease in erosion and sediment loss leading to an increase in water quality around his property. Any water running off the farm appears clear. Ed is a Trustee at his church and a member of the Burney Clay Fire Department Board. Dubois County – Roger & Brenda Sermersheim of Sermersheim Farms utilize WASCOB’s, grassed waterways and grassed buffers to keep nutrients and sediment from leaving their property. They have used continuous No-Till with a cover crop system started by his father in 1968. Water is clean and clear when leaving their fields with nutrients and sediment being filtered before it leaves the property. 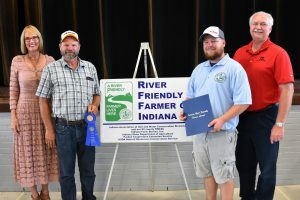 They share their conservation practices and success in a variety of community groups including their local SWCD, their church, county FFA Advisory board and local cemetary board. 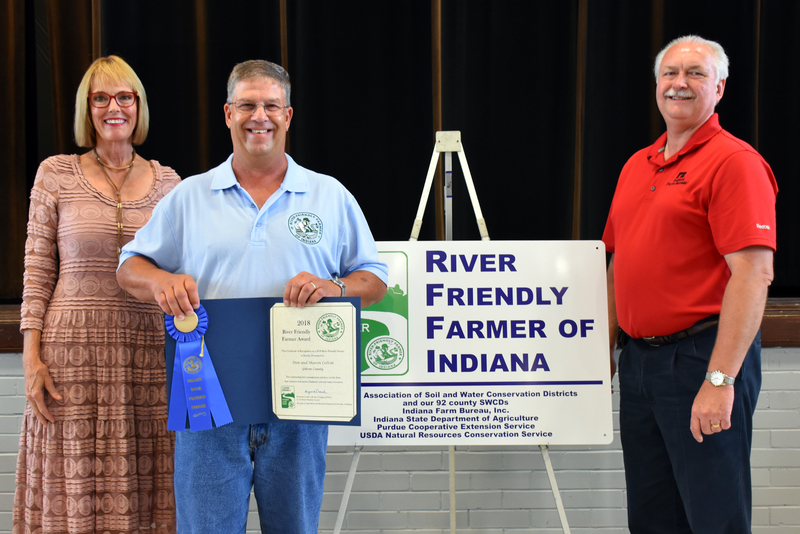 Elkhart County – Marty Moser produces Corn, Soybeans, Wheat, and Seed Corn on his multi-generational farm. His conservation practices include No-Till, Cover Crops, Grass Filter Strips, Water Ways, and Terraces. These practices have helped to hold the soil in place, decreasing runoff from rain water and wind erosion. He states that these practices have also improved his bottom line as they are not losing top soil and nutrients. They have also experienced a decrease in labor and equipment expenses. He is a member of the Peoples Bible Church in Benton. Fayette County – Keith Hubbell’s farm has been in his family since 1840. 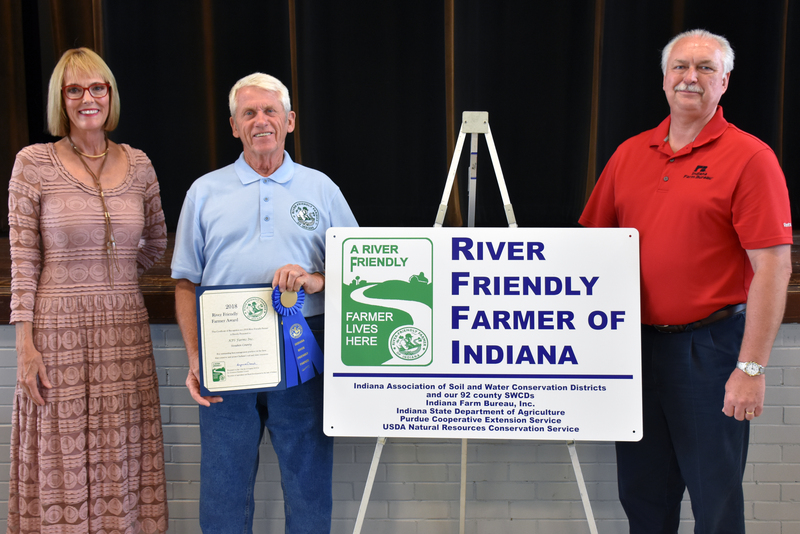 He produces corn and soybeans where the East and West Fork of the Whitewater River run. He has experienced less compaction, less erosion and lower input costs since he began no-tilling in 1975. He has observed that the soil is healthier and its water holding capacity has improved as a result of using cover crops beginning in 2012. He has seen that less water leaves the farm and the water that does drain off contains little or no soil. He has also installed waterways. Keith is an FSA board member, past member of Cooperative Extension Board, Farm Bureau Board, and 4-H leader. Gibson County – Though the Colvin’s come from a non-farming family they realize the value of Best Management Practices in order to build healthy soil. Their conservation practices have decreased erosion and thereby kept the soil and sediment from draining off the property. Five of their 72 acres are grassed waterways. By implementing no-till along with 15 WaSCOB’s on the property, as well as rotational grazing, they’ve been able to keep nutrients on the farm. 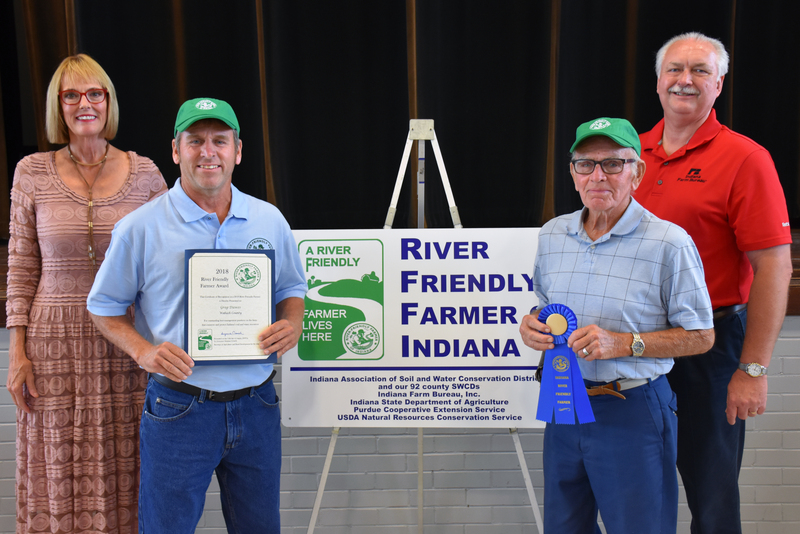 Hamilton County – Andy Padgett’s farm produces corn and soybeans in the Upper White Watershed. His practices of no till, cover crops, grass waterways, and structures have stabilized erosion control. His use of cover crops has improved soil health and soil structure on his farm. The benefits of his conservation practices include decreased runoff and a reduction in erosion. He has implemented filter strips as well along open drains. 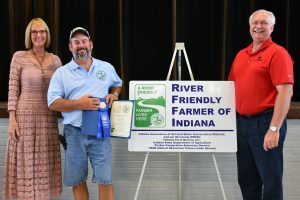 Andy is a former chair of both the Boone County SWCD and FSA committees working with the Hamilton County Highway Department to construct waterways. Hendricks County – Wyeth Farms INC. received Conservation Farmer of the Year from Hendricks County in 2017. They have implemented several conservation practices on the property resulting in reduced erosion, improved water infiltration and building organic matter in the soil. Their farm produces corn, soybeans, wheat, hay as well as beef cattle. Cover crop benefits include ground water infiltration, decreased compaction and nutrient absorbtion. Waterways have slowed down the water runoff allowing opportunity for nutrients and sediment to stay on the farm. Field borders have provided habitat for wildlife. Wyeth Farms Inc. works with the Hendricks County SWCD in displaying signs in their fields in order to educate the public on the use of cover crops. Howard County – CJMR Corp. is located in the Deer Creek and Wildcat Creek Watersheds. Jerry, along with two of his brothers operates a 4th generation family farm that received the Howard County SWCD Conservation Farmer of the Year award in 2018. On their property, they implement reduced tillage, grassed waterways, and pasture management. They realize the financial costs to losing soil and nutrients on their field and have used buffer strips around all of their open ditches. They also practice forest management on about 25 acres of woods. CJMR Corp. participates in the INField Advantage stalk sampling program and soil sampling every two years on a two acre grid. 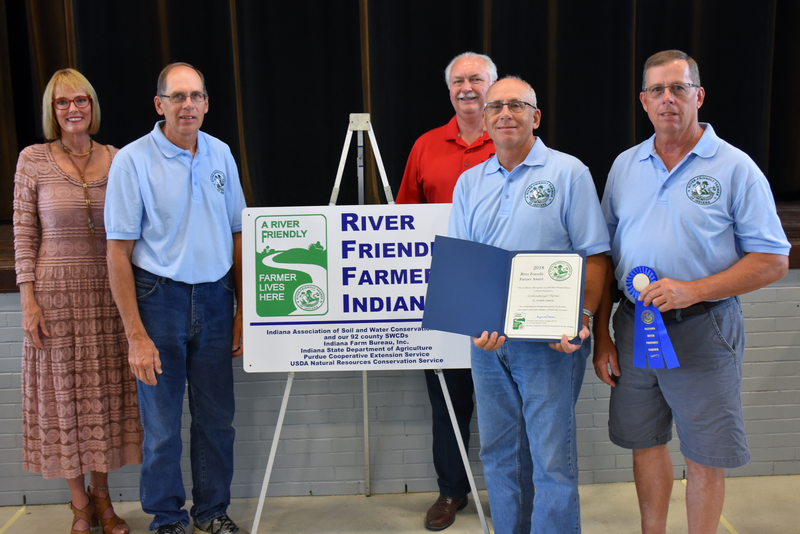 They are involved in their community as a Farm Bureau board member, church and county Ag Day program as well as the high school robotics team. Huntington County – Gary Minton shares information with his neighbors and friends about how his conservation practices have helped protect water and air quality. He has implemented wetland restoration, bottomland tree planting, and filter strips. He has provided wildlife habitat area which has increased both wildlife and pollinators. Gary has noticed a reduction in erosion on the farm, thus preventing excess nutrients from entering the rivers and streams. Huntington County – James Minton’s farm is in CRP and CREP programs and is located in the Upper Wabash River Watershed. He shares with his friends and neighbors about his projects and how they help protect and improve water and air quality and provide a natural habitat for wildlife and pollinators. 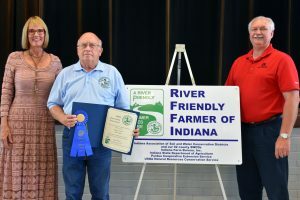 His conservation practices which also include wetland restoration, bottomland tree planting, and filter strips have helped to decrease erosion and help absorb excess nutrients and prevent them from entering rivers and streams. Jackson County – The Indian Creek Acres farm of today is part of a long, rich family farm history. Mary Elisabeth and her family have received numerous awards and recognition over the past few decades. The farm is located in the Upper East Fork of the White River, where it primarily produces corn and soybeans in rotation; as well as, a small number of polled Hereford feeder calves each year. The farm uses no-till planting, cover crops, grid-style soil sampling, grass buffer strips, and grassed waterways. Mary Elisabeth is deeply interested in providing a safe place for creatures great and small in the form of good habitat. She was the first landowner in Jackson Co,. to plant pollinator forbs and grasses through EQIP. 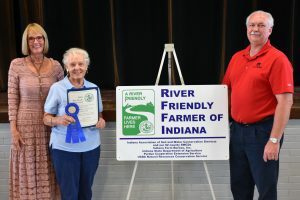 Her conservation practices have helped to prevent erosion and have stopped sediment from leaving her farm as well as ceasing sediment flow from upstream fields. Mary Elisabeth has been able to share her passion for protecting natural resources by hosting conservation tours, wildflower walks and her local FFA students to soil judge. 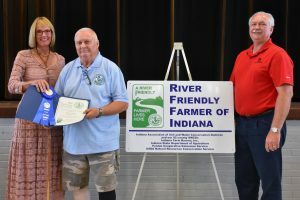 Jay County – DMH Family Farms has received numerous conservation awards and honorariums throughout the years; and, has been owned by the same family since 1846. This farm currently produces Corn, Soybeans, and Wheat. Dennis & Marianne Horn’s conservation practices include No-Till, Strip-Till, Filter Strips, Waterways, and Cover Crops. 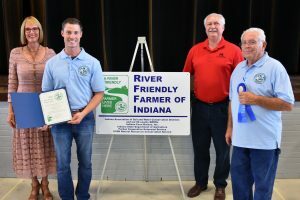 They have seen water that typically would run off fields directly into streams now being filtered through waterways and filter strips to keep rivers and streams more clean. 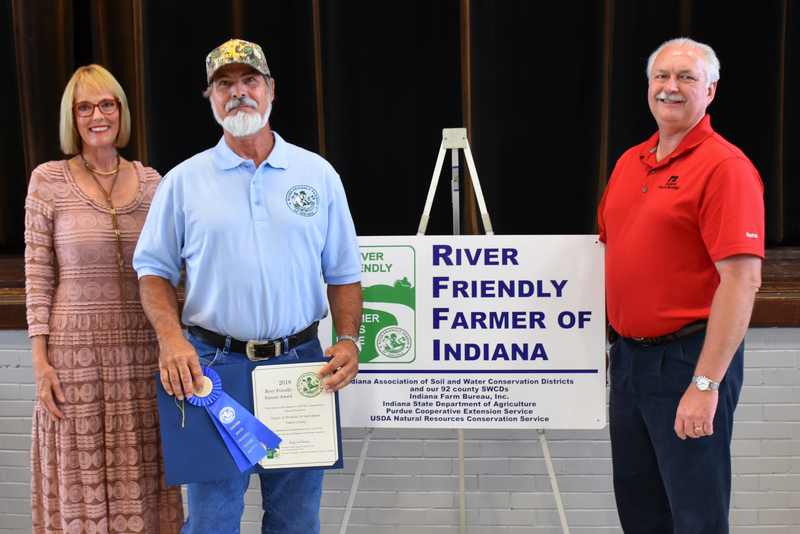 Dennis supports the local FFA chapter, is a Past SWCD Supervisor, and Farm Bureau member. Marianne supports the local FFA, is a Farm Bureau member, and a founding member of Friends of Agriculture Endowment within the Local Portland Foundation. 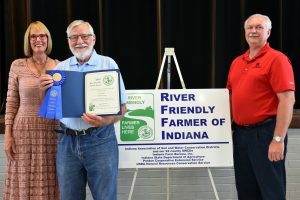 Jay County – Ken and Ann Brunswick’s farm is located in the Upper Wabash Watershed where they produce corn and soybeans and have several acres in CRP. On their highly erodible ground, purchased in 1976, they have warm season grasses. The land is recovering and includes pollinator habitat, wild flowers, and native plantings. Wildlife continues to increase annually. A riparian corridor along Wolf Creek has been maintained and filter strips have been added to the cropland side. They state that their conservation practices have helped to hold the soil in its place. Kenneth is involved in several conservation organizations, is a past SWCD Supervisor and active in his church. Jefferson County – Brawner Farms located in the Central Muscatatuck Watershed produces Organic Milk, Corn, Soybeans, and Alfalfa Hay. Their conservation practices include cover crops, no-till planting, animal walkways, Heavy Use Area Pads and Automatic Waterers. Greg states that conservation practices are very important to his operation because he has a family farm of nearly 80 years and he wants to protect the resources for generations to come. He has seen first hand the impact of organic matter using cover crops and the improvement to soil health. In addition, since implementing these conservation practices, the sediment runoff from the farming operation is much cleaner. Greg is a member of Farm Bureau, 4-H, Farm Service Agency Board, and Past Board Member of the Kent Water Company. His children are involved in the farming operation and he looks forward to his grandchildren being a part as well. Knox County – Holscher Family Farms is a 1,775 acre grain and livestock operation in Knox County. Their grain rotation includes corn, wheat, and soybeans; and, the livestock includes a Turkey Growout Facility. This farm has implemented various conservation practices, which have benefitted in long-term productivity gains, reduced fuel consumption, and lowered maintenance costs. 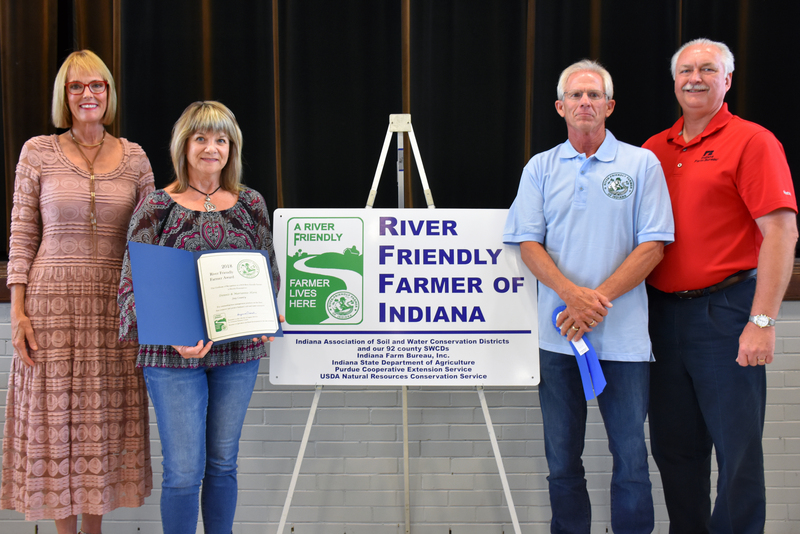 They work closely with the Knox County SWCD on their Turkey facility as well as their other conservation practices of filter strips, cover crops, grassed waterways and more. The result has been healthier soils including better soil structure and higher organic matter. 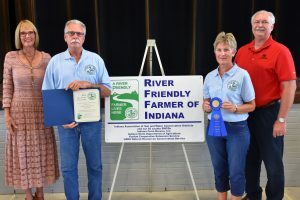 Their use of Filter Strips, No Till, and Cover Crops has enabled them to capture more of the product they apply to the fields thus reducing unwanted runoff into the watershed. They also have acreage that is providing habitat for deer, turkey, quail, waterfowl, and numerous reptile and amphibian species. Kosciusko County – Mullet Farm produces grain and hay near the headwaters of the Yellow River/Kankakee. Their conservation practices of No-till, precision farming, pasture management and rotation, including hay, have had positive impacts on soil health and water quality. Paul states that his participation in the EPA 319 Yellow River project and seeing the impacts of conservation on water quality has encouraged him in implementing these practices. 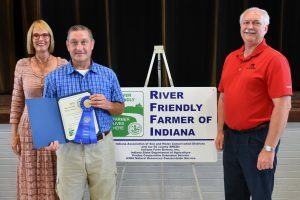 He is a past recipient of the Kosciusko County Conservation Farmer of the Year award. 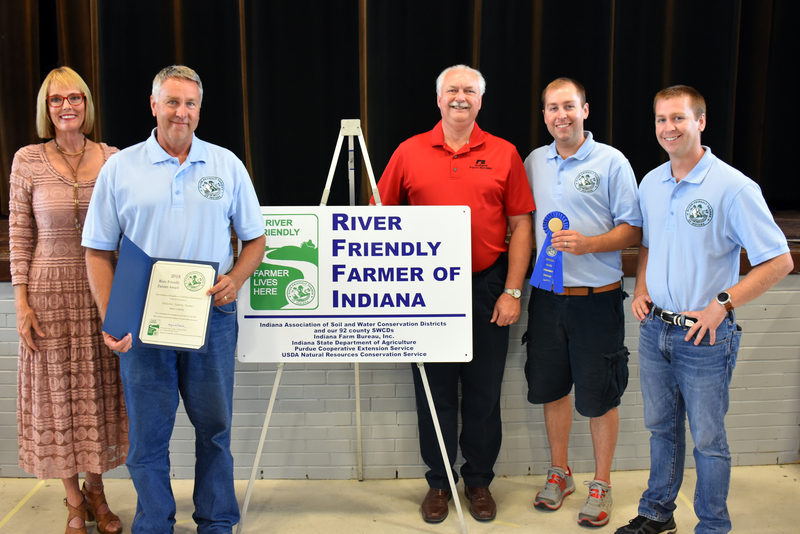 LaGrange County – Nathan, Aaron and Allen Wisler make up Wisler’s Family Farm producing seed corn, corn, soybeans, hay, and potatoes. Recently, they have been working with the local SWCD and LARE program to plant cover crops. They have noticed improved soil structure, health and productivity, decreased erosion and sedimentation. They have increased their use of no-till in both corn and soybean production with similar results. Hereford beef cattle are raised and fenced away from bodies of natural surface water, separated by filter strip areas. Of the 1000 acres total on the Wisler Farm, approximately 120-140 acres is wetland and/or upland forest wildlife habitat area. This is home to many water related species of wildlife like Great Blue and green herons, threatened species of frogs and snakes, and upland birds and mammal species like pheasants, deer, rabbits, squirrels of at least three subspecies, foxes, coyotes and possibly badgers. 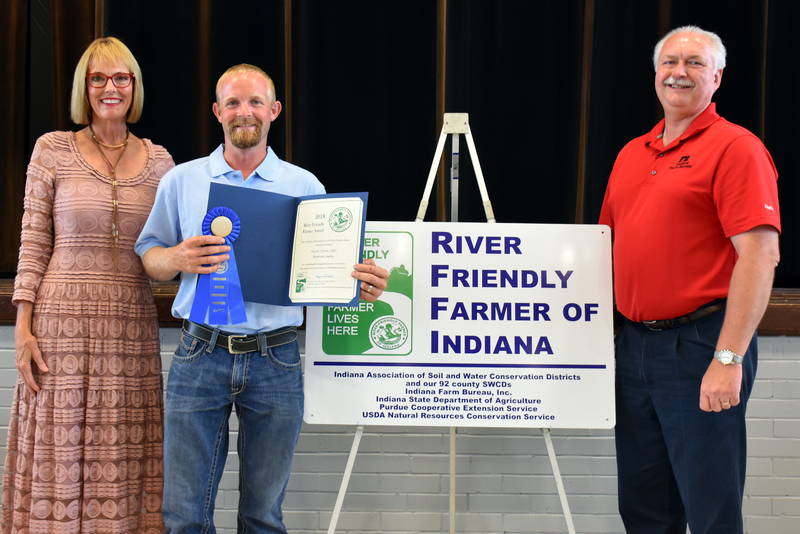 Madison County – Josh Miller of Richard Smith Farms, Inc. is a 5th generation farmer located in the Upper White Watershed producing grain and livestock. Being a no-till operation for over 20 years, this farm has experienced increased organic matter. Through their use of cover crops, they have increased soil tilth and drainage. Installed filter strips, grassed waterways and crop rotation have improved run-off and lose of nutrients. In addition, Richard Smith Farms, Inc. splits nitrogen application to prevent excess nitrogen leeching in the groundwater. 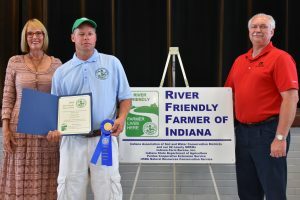 Josh is a member of the Indiana Corn Marketing Council, US Grain Council and the Township Trustee. Marion County – Indy Urban Acres, a project of the Indianapolis Parks Foundation, grows 45 types of fruits and vegetables. 100% of the produce is donated to people in need. Warren Creek flows through this property and eventually into the White River. Their conservation cropping system creates a more resilient system that can better endure droughts and heavy rain events. With cover crops and mulch, Indy Urban Acres is seeing less erosion and less water leaving the farm. They utilize cover crops and mulching with hay and straw to keep the soil covered and healthy. A large rain garden with deep rooted native plants is located at the end of their high tunnel allowing water to soak into the ground and reduce runoff. They are committed to soil conservation and education. Through volunteer groups, approximately 500 people have physically engaged with implementing soil health practices on this farm. Soil health is presented on every tour of the farm and their summer teen work groups receive a class in soil health. 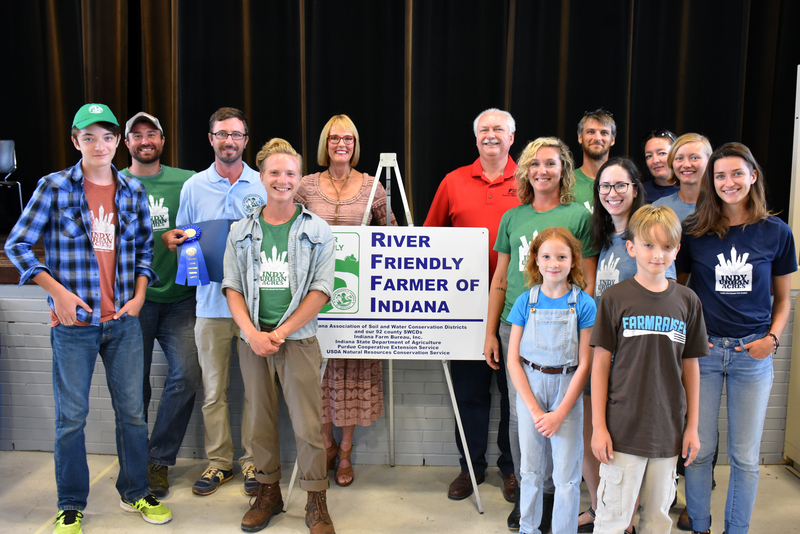 Indy Urban Acres works closely with the Marion County SWCD in sharing experiences and ideas to advance and improve soil health systems on urban vegetable farms; and, they provide vegetable starts and space to the Marion County SWCD. 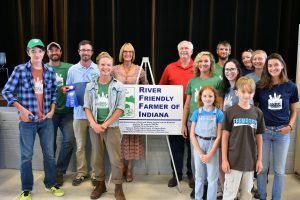 Marion County – The STEM Connection Moore Road Farm is a 30-acre production farm and learning site located in the historic Traders Point Rural Historic District and Eagle Creek watershed. 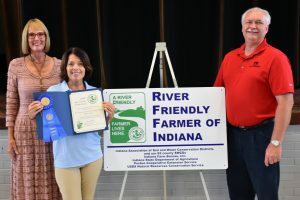 Recently, this farm received an Outstanding Education and Conservation Award for their outreach and education efforts. They presently grow alfalfa on the majority of the farm and have an apple orchard and a one-acre vegetable garden. Vegetable crops are grown using the soil health practices of compost, mulch, cover crop rotation, reduced tillage and nutrient management. The alfalfa field provides excellent erosion control, pollinator habitat, and wildlife cover. Bald eagles are frequently viewed on the farm. A riparian buffer runs the entire length of Eagle Creek and provides wildlife cover and year round soil cover reducing runoff and sediment going into the creek. With this farm, over 4,000 students, annually, receive hands-on experience with conservation projects showing results of better soil health and water quality. The Moore Farm partners with the Marion County SWCD to serve as a demonstration site for specialty crop soil health practices. They have also hosted urban soil health breakfast meetings and worked with schools in providing outdoor learning experiences. Miami County – Snavely Farms is located in the Middle Eel River Watershed where they produce grain and have livestock. Their conservation practices include 100% no-till, cover crops, and nutrient and pest management. 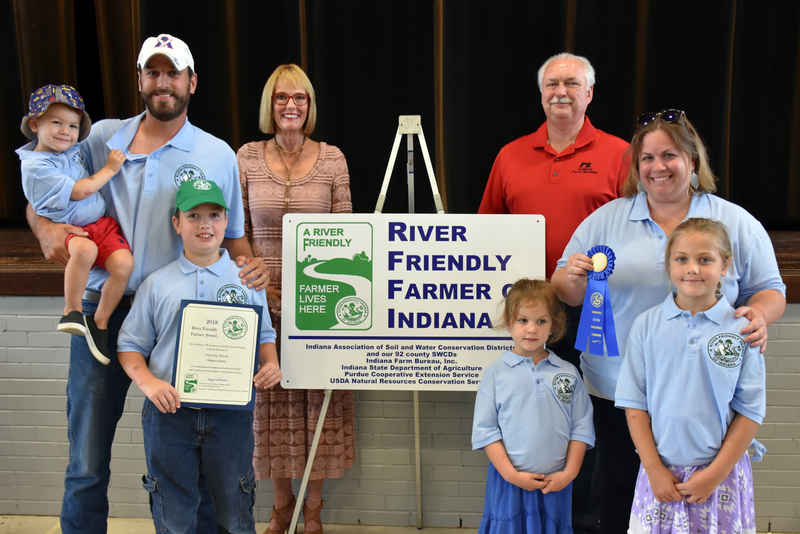 They are 6th generation farmers moving to Indiana in 2016 from Lancaster County, Pennsylvania. This farm has been no-till for 30 years and the Snavely’s have added cover crops to suppress weeds, build soil health, better control nutrients, and improve water quality leaving the farm. The Snavely’s children are active in 4H. 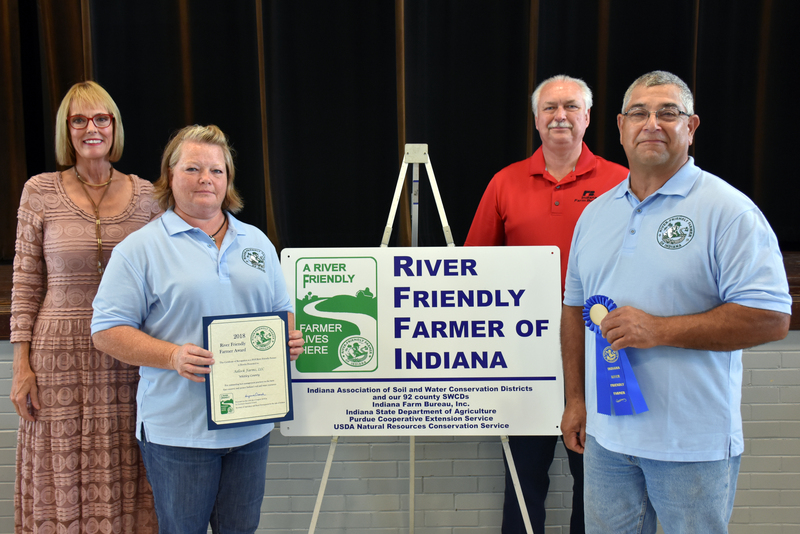 James and Paula are Indiana Farm Bureau members and active in Oakbrook Church. Newton County – Deloris Hall has lived and raised her family on this same farm for the past 49 years. This acreage produces corn and soybeans in rotation in the Iroquois River watershed. One half of her farm is in CRP with filter strips protecting the waterways passing through the property. These strips have provided wildlife and pollinator habitat along the river. They have also decreased erosion along the banks preventing sedimentation. The remaining one-half of the acreage is cash rented to a local farmer who practices no-till. Deloris and her family have been heavily involved in 4-H, Extension Homemakers and she worked in the Newton County Extension office for 9 years. 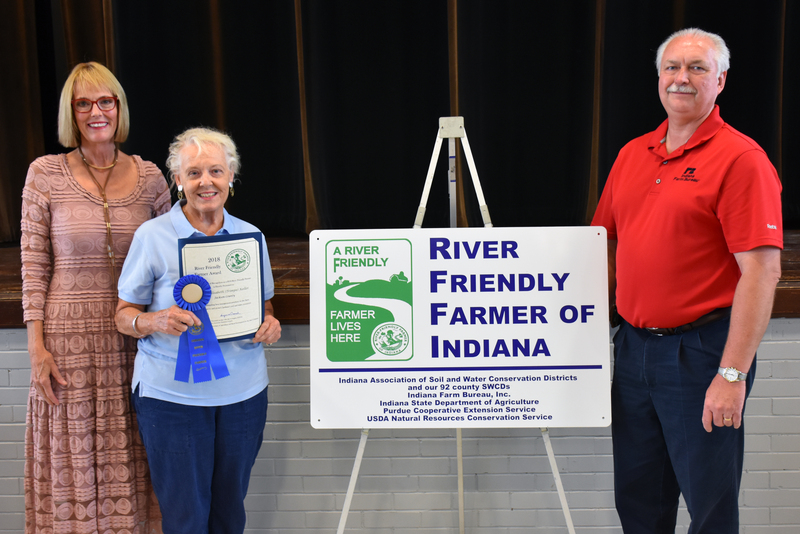 She has been a Farm Bureau member for 61 years. 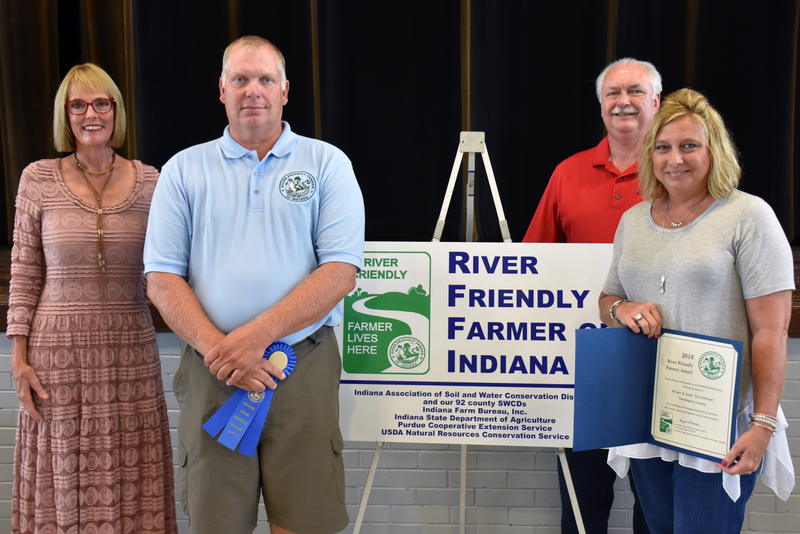 Newton County – Randy and Becky Hall entered into the CRP program in 2009 with 2.8 acres of riparian forest buffer. After seeing the positive results, they increased to 51 acres of CRP. Using grasses and flower mix in CRP has helped filter and stop erosion of soil and farm chemicals from reaching the water. Wildlife has increased on the property including deer, pheasants, and several other birds, including eagles. Their land is located in the Iroquois River watershed and produces corn and soybeans in rotation. After years of conventional tillage, causing serious erosion, they decided two years ago to cash rent to a local farmer with updated equipment of all no-till. They have been members of several local organizations including 4-H, county fair board, Mt. Zion church, and volunteer firemen. Posey County – Dennis & Connie Angel produce grains in the Lower Wabash watershed. 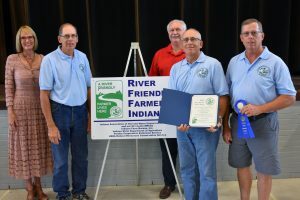 They have approximately 125 acres of wetland/woodland including 25 acres along the Wabash River. Their conservation practices have increased the quality of their ground by holding it in place; thus helping to keep all inputs from leaving the property. Having more cover on the surface helps retain water throughout the growing season. By using a minimum tillage system they have less soil erosion from water runoff. The wetlands/woodlands they maintain provides cover for wildlife and pollinator habitat. Dennis served on the SWCD board from 1998 – 2003 serving as both Chairman and Vice Chairman. He is a board member of Posey County Farm Bureau Inc., a Mt. Vernon School Board Trustee, and a longtime member of the Mt. Vernon Community Church. 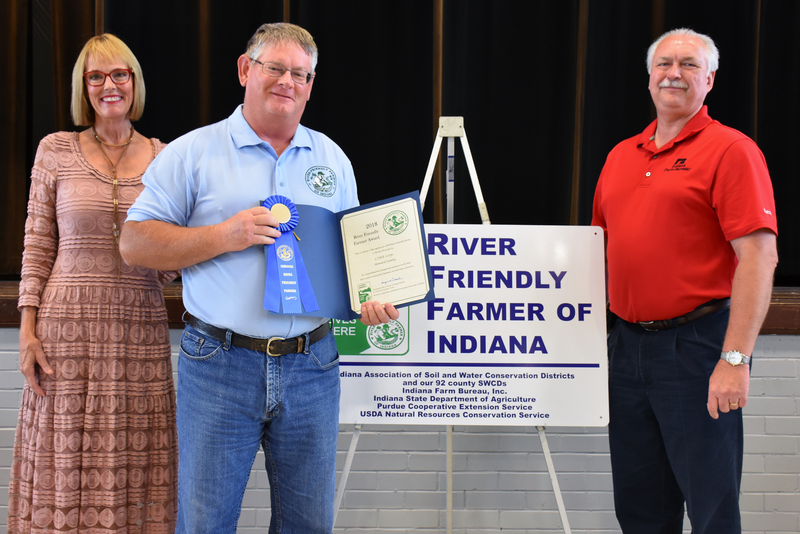 Posey County – Seibert Brothers, Inc. produces corn and soybeans. They initially started with cover crops to help with erosion control and soon learned the additional benefits to microbiology – better soil production leading to higher yields. They focus on keeping soil on the farm and out of the surrounding waterways. Several waterways run through the property with multiple terraces. The outlets are also terraced. Nine acres of their woodlands property is reserved for wildlife habitat. They have been involved with the 4-H Advisory Board, various Church Boards, Men’s Club, the local school board and St. Vincent DePaul. They were Conservation Farmers of the Year in 1994. Putnam County – Hillside Farms, originating from the early 1920’s, is located in the Little Walnut Creek watershed. It is a row crop farm with a corn and soybean rotation and a small percentage of wheat. In 1991, they decided to be 100% no-till. Chris and his son work together and they use cover crops on approximately 60% of their acreage to decrease soil loss and increase organic matter in the soil. They have installed drainage tile and waterways to improve water quality of the water leaving their farms. Soil health and protection is their number one priority so that the fifth generation in their family receives a healthy farm. They plant pollinator species every year in areas that are not productive for row crops thus providing for pollinators and suppressing weeds. They have shared their conservation success with area landowners as well as DePauw University students. 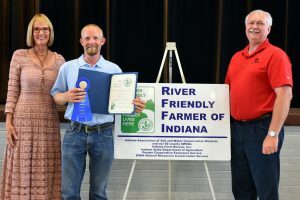 Scott County – Goodin Farms based in Austin, Indiana produces and raises beef cattle, cattle forage-hay and forestry on mostly highly erodible ground. 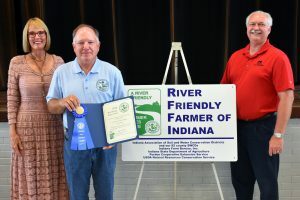 Terry participates in EQIP, and has experienced less run-off and erosion, less nutrient loss and improved soil health with his conservation practices. His farm uses Heavy Use Area pads for watering and feeding as well as strategic manure application. Soil testing is done to manage nutrient applications. Rotational and Flash grazing is practiced to keep the pastures healthy. Grasslands, pollinator and wildlife habitats have also been established. 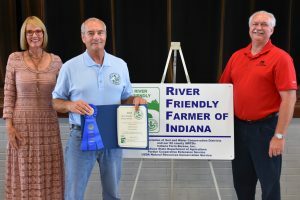 Terry is a Farm Bureau member, supports 4-H and is a State Legislator, where he is continuously reminding folks to consider where their food comes from and all that is involved in its production. Spencer County – Dr. Brett Stallings, of Stallings and Young Farm, is located in the Lower Ohio-Little Pigeon watershed. Brett’s father began no-tilling in the 1960’s when it was not popular and Brett has continued the practice to maintain healthy soil on his tracts. This property produces corn and soybeans in rotation. Brett states, “The bottom line is soil health. If the soil isn’t healthy, alive, it will not have the structure it needs to stay in place and not erode.” He utilizes no-till, rotation, buffer strips and WASCOBs to accomplish this goal. Wooded areas are left as woodlands and maintained for wildlife habitat. Buffers are left to encourage wildlife and provide corridors. The water which runs off the farm is very clear. Brett is involved with the Parish Council at his church and at-risk youth. 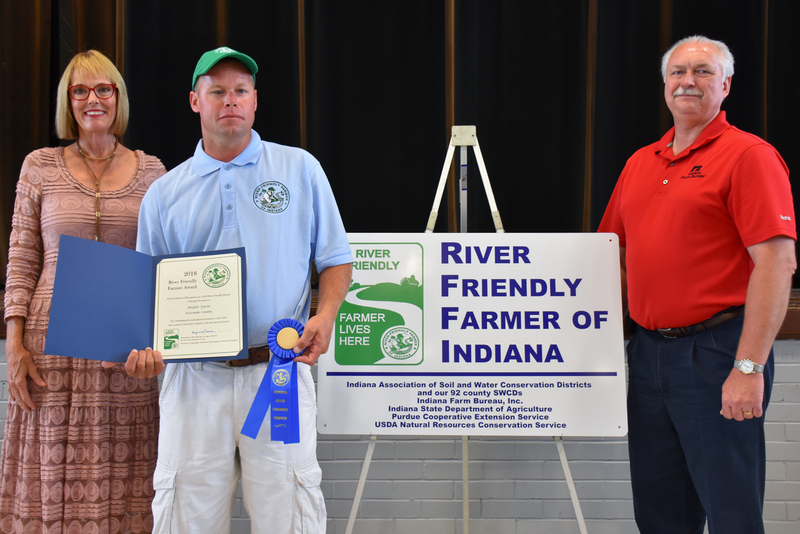 Spencer County – Greg Sermersheim, of the Lower Ohio – Little Pigeon watershed, produces corn and soybeans. He utilizes conservation practices of 100% no-till and grassed waterways. His goal is to save the soil. He states that no-till prevents soil erosion from beginning and grassed waterways help prevent the soil from entering the water. He has also implemented food plots for wildlife, wildlife water holes, and a chestnut restoration project. St. Joseph County – Gamble Dairy Farm, LLC is located in the Little Calumet-Galien & Kankakee watershed. This farm produces Milk, Corn and Alfalfa. They believe that conservation practices are important because we all have a responsibility to take care of our natural resources. By utilizing the practices of no-till and cover crops, as well as side dress nitrate testing, they have decreased the amount of soil erosion in their fields. Less erosion has also lead to less nutrients leaving the fields and entering the waterways. They also practice rotational grazing, recycle the water, and test the nutrients in the cow manure before they apply it to the field. They are active Farm Bureau members as well as involvement in 4-H and FFA. St. Joseph County – Lichtenbarger Farms produces corn and soybeans in the St. Joseph & Kankakee watershed. This farm began in 1932 and currently has family of second, third and forth generations working on it. Their conservation practices include No-till, cover crops, irrigation management, grassed waterways, and soil testing with variable rate fertilizer application. Their no-till fields do not have washouts after a major rain and therefore their nutrients are staying on the farm and not entering the ditches and rivers. Lichtenbarger Farms meets with a forester who identifies trees for harvesting. They also have provided plantings for wildlife habitat. David and his family support the local St. Joseph County Ag Days, participate with 4-H and are Farm Bureau members. Starke County – Bope Farms produces corn and soybeans in the Hook Run/Bogus Run watershed. Conservation practices on his property include filter strips, cover crops, Minimum Till, nutrient management and pest management. These practices have helped to keep pollutants out of the ditches; and the filter strips, in particular, have improved wildlife habitat. Perry is a past superintendent and teacher at Davis Wesleyan Church in Hamlet. Starke County – Kozubik Farms produces Corn, Soybeans, Hay and Wheat where several ditches run through the property. Cody plants corn 3 years in a row and then 1 year of beans. This has resulted in increased soil health and better filtration of any water leaving the property. He rotates hay on higher sand hills and has experienced a build up of organic matter in this area, also reducing erosion. Near his wetlands, he has installed silt fences to prevent soil from washing in erodible areas. Cody is indirectly involved in 4-H by helping his nieces with their 4-H projects and he donates straw to the local Battle of the Barns. Steuben County – KPS Farms is a family owned farm located in southwestern Steuben County. They farm over 2,100 acres of corn, soybeans, wheat, and hay. The primary conservation practices they implement include no-till, cover crops, filter strips, and nutrient management. Cover crops have contributed to the organic matter, curbed soil erosion, promoted soil health, conserved moisture and boosted fertility. No-till, cover crops, and filter strips all assist with keeping nutrients and sediment on the fields; not losing what is there to surface water or the aquifer. The addition of conservation practices has also been economically advantageous by decreasing the amount of fertilizer required. 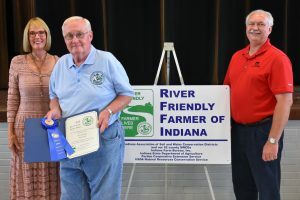 Jerry received the LaGrange County SWCD Long Time Service Award in spring 2018 for his tireless efforts in promoting soil and water health, promoting rotational grazing, and assisting dairy operations. 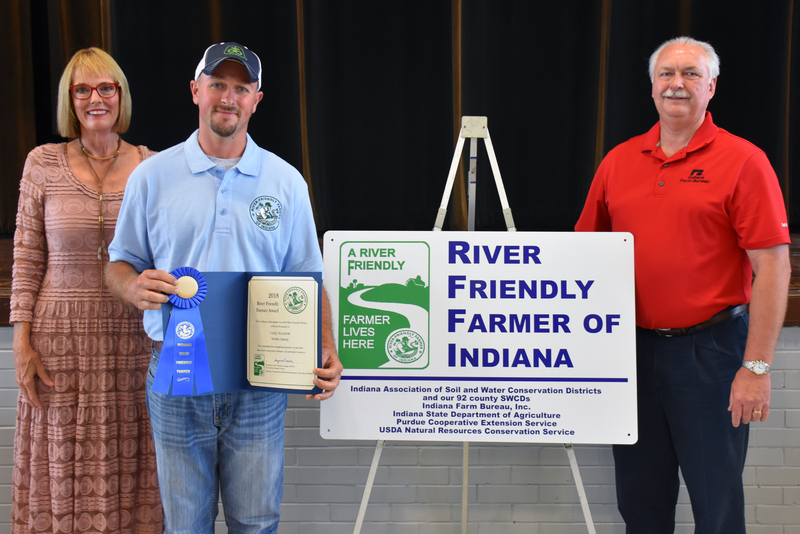 Tippecanoe County – Weldon Vaughn’s farm had produced corn and soybeans until he recently enrolled the land into CRP. There are a variety of conservation practices on the property, including prairie plantings, filter strips, woodlands, and a wetland, all of which provide wildlife habitat. Filter strips along the ditch help to trap sediment. Weldon’s conservation practices have led to an increase in wildlife, and even more so with the newly planted quail habitat. Besides quail, the conservation practices on this farm have provided habitat for a wide variety of other wildlife, including Meadowlarks, Bluebirds and Monarchs. Weldon attends SWCD field days and events and assists the SWCD with storage and maintenance of a no-till drill. 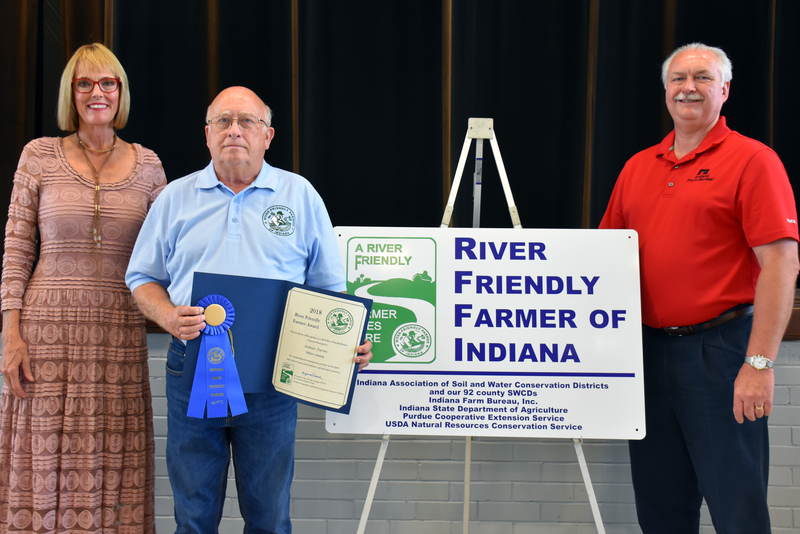 Vanderburgh County – Carl Schmitt’s farm located in the Lower Wabash watershed produces row crops of Corn, Beans and Wheat, Milo and Sweet Corn. 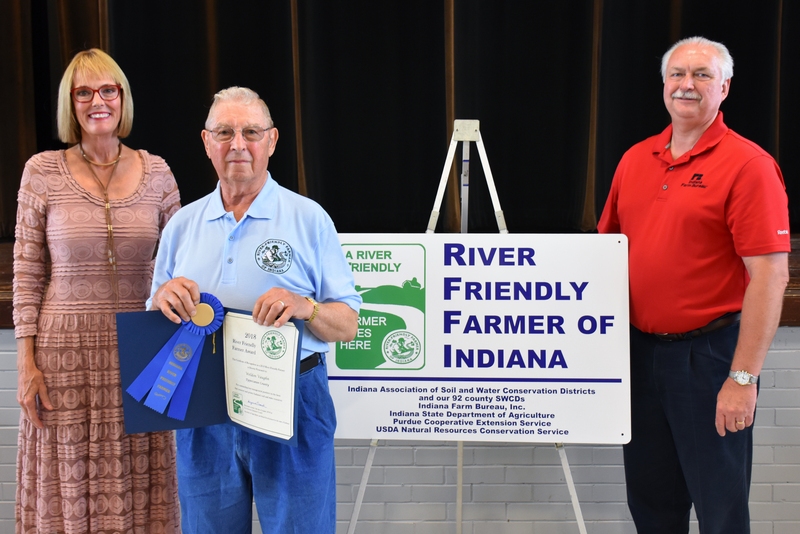 His family farm of 150 years includes ditches that eventually drain into the Wabash River. Carl uses no-till and cover crops and he has installed filter strips, waterways and tile throughout the farm. More soil is staying on the property and not flowing int the ditches due to his no-till practice. He is working hard to improve the microbial levels in his soil. 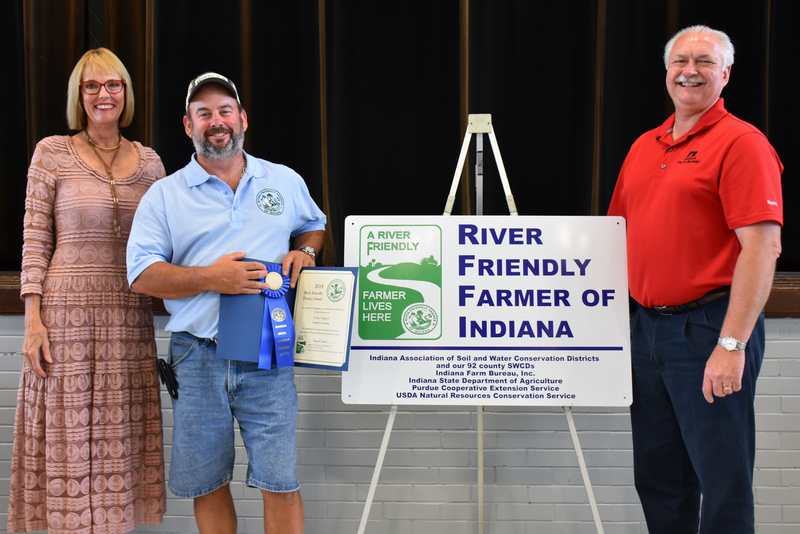 Wabash County – Greg Dawes of Liberty Acres is located in the Wabash River Watershed and Mississinewa River Watershed. This three-generation family farm received the 2017 Wabash County Farm Family of the Year Award. Liberty Acres produces corn, soybeans, wheat, alfalfa, and includes 40 Holstein cows. Conservation practices include cover crops, no-till, grassed waterways, filter strips, WASCOBS, grade stabilization structures, rock aprons and chutes. Benefits of these practices include improved soil health and water movement through the soil, decreased soil erosion, decreased nutrient loss due to leaching, and less compaction. 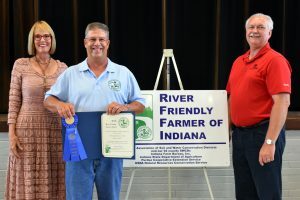 Greg has volunteered at the Wabash County 4-H fair for 30 years and his farm hosts local and district FFA/4-H dairy and soil judging contests. Warrick County – Stahl Farms is a multi-generational farm which produces corn and soybeans in the Highland Pigeon watershed where Pigeon and Cypress Creek pass through the property. This conservation-minded family has been farming since 1854. They state, “Our business is centered around the quality of the land and our approach is ‘What can we do to improve what we’ve been given?’ The land is a living organism, and we treat it as such. It’s an investment in our future. If we’re not conserving our resources and trying to make them better, what are we leaving for the next generation? We have seen the benefits of our past investments in conservation.” They use no till, grassed waterways, filter strips, dry dams, WASCOBs, band fertilizer, and cover crops. These practices have reduced the leaching of sediment, reduced rates of fertilizer; and, improved soil health and infiltration. This is a past hub farm for the Conservation Cropping Systems Initiative (CCSI) program. Washington County – This farm operation is in it’s fifth generation. And, over one hundred twenty (120) acres of it has been farmed for over 100 years. Brian & Julie Wischmeier started no till on their farm in 1989. Since then, they have added drainage tile annually. This has greatly reduced nutrient runoff and helps create a better environment for microbes to multiply and increase soil health. They added cover crops which has lead to increased yields. Nutrient management, pest management, filter strips, grassed waterways and field borders have all added to water quality and cover for ground birds and rabbits. Wayne County – Bowman Superior Genetics is a family start-up operation which breeds and raises purebred beef seedstock, freezer beef, and feeder calves. They rent out their cropland, where their tenet utilizes no-till, cover crops, and grid sampling. Topsoil preservation is key in the production of healthy, abundant forages for their beef cattle to graze, along with helping to keep the waterways clean. By installing and utilizing Heavy Use Areas, Grassed Waterways, Watering Facilities and Spring Developments they have greatly reduced the amount of topsoil erosion and surface runoff. Rotational grazing, manure management, extensive fencing and paddocks, exclusion fencing, spring developments, and watering facilities are all incorporated into their conservation farmland system. They are involved with the Wayne County SWCD during Conservation Days. They are members of various beef cattle associations and Farm Bureau. 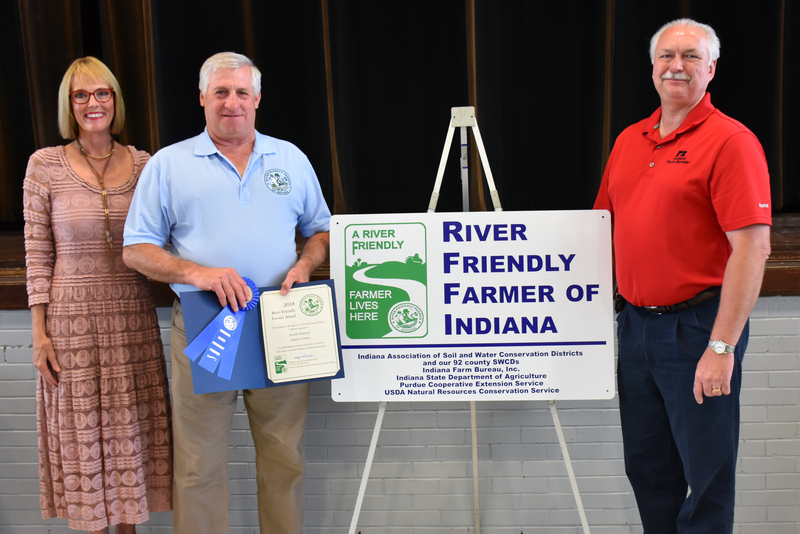 Phillip and Linda won an outstanding service to agriculture award and hosted a chamber farm tour in 2016. 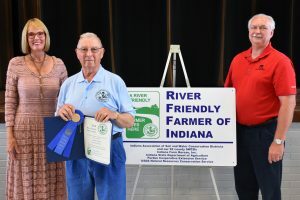 Wells County – Ron Springer has been farming for 55 years on his farm located in the Upper Wabash watershed. He has experienced increased yields and very little soil loss due to his conservation practices. His priority is to build soil health and soil tilth. He has used cover crops for five years and no-till for 12. He also has incorporated waterways, WASCOBS, and a grade stabilization structure. Ron shares his success stories and knowledge from his family farm of 250+ years in his local church and with his neighbors. 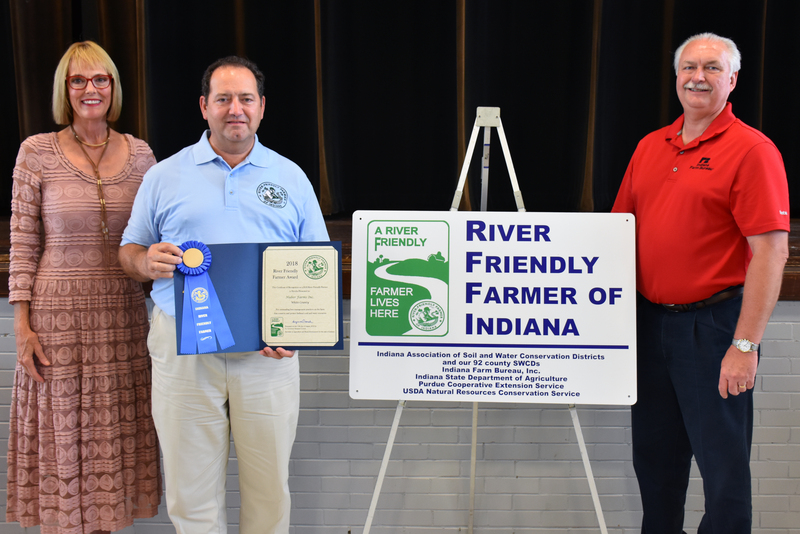 White County – Huber Farms Inc. is located in the Tippecanoe watershed and produces Corn & Soybeans. They practice no-till, strip till, and cover crops. The Huber’s state that these practices have been building the soil and holding it in place. After a big rain, they have witnessed reduced erosion and cleaner waterways. They have wetland and multiple wooded areas which allow plant and wildlife to thrive. They also have many CRP acres which provide wildlife habitat and protect the ditches. Brian and Phil are passionate about impacting future generations and are both very active in their local church. Brian is a pastor and a member of a national aid relief board. Phil teaches Sunday school and helps with local outreach. 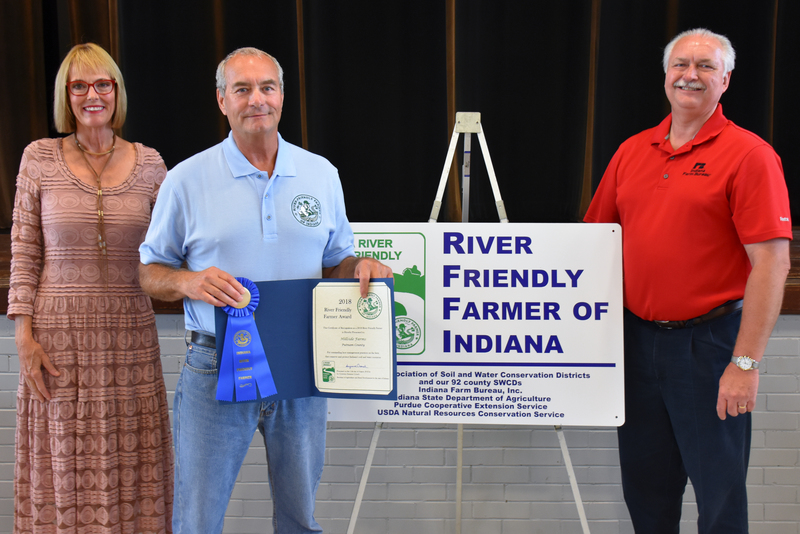 White County – Kilmer Farms produces corn and soybeans in the Wabash River, Big Pine and Tippecanoe watershed. Larry’s conservation practices include strip-till corn and no-till beans as well as cover crops. These practices have slowed down the water leaving his propery and filtered out nutrients. Larry also has acreage in CRP providing wildlife habitat. Larry has been active on the White County SWCD board and vounteers with 4-H and FFA. Whitley County – Both Joe and Sarah come from a long family history of farming. 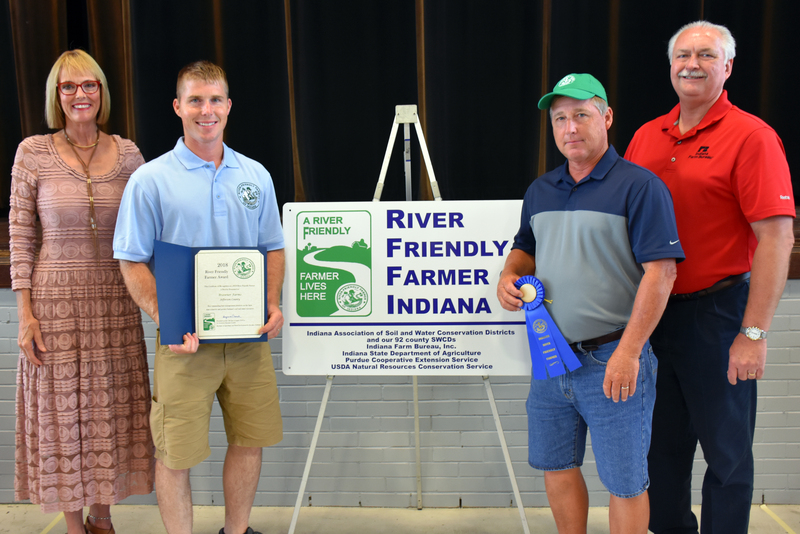 Adlock Farms located in the Tippecanoe Watershed produces Grass Fed Beef, corn, beans, wheat and hay. They started using cover crops eight years ago and state, “You’ve got to see it to believe the difference.” They also practice no-till and rotational grazing. 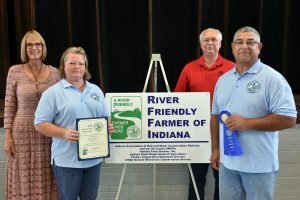 The Lopez’ were experiencing wash outs and standing water after a heavy rain, but no-till has helped with their erosion problems and also keeps their fields green year round. Less erosion has lead to less sediment in the water. They have also noticed an earthworm population increase. They have 15 acres of woods that is enrolled in the Certified Forest and Wildlands Program. They are members of Farm Bureau, Inc and support FFA and 4-H.